Brenda Jennissen, Felling Trailers Inc. CEO, and Bid Winner Kevin Middendorf, Middendorf Construction LLC. 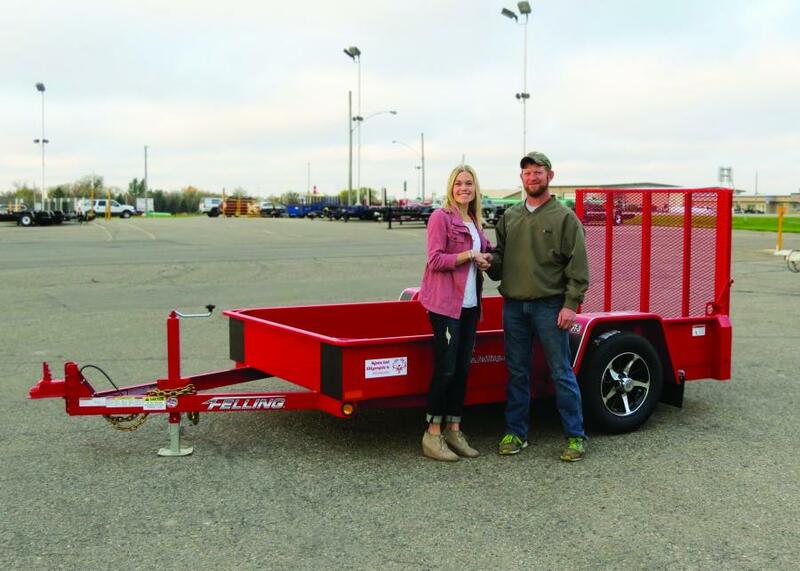 Felling Trailers Inc. conducted its fifth annual online auction of an FT-3 drop deck utility trailer to benefit a non-profit organization, Special Olympics Minnesota. The winning bid of $2,900 was placed just minutes before the auction closed on Oct. 5, 2017. The bid winner was a local contractor from Sauk Centre, Kevin Middendorf, owner of Middendorf Construction LLC. Middendorf's son had seen the Trailer for a Cause auction in the Sauk Centre Herald, a local paper and told him "Hey dad, we need a trailer, and this looks like a nice one, you should bid on it." “So we decided to put a bid in and support the fundraiser,” said Middendorf. The 2017 Trailer for a Cause FT-3 utility trailer was painted in Felling's Viper Red and dawned a custom decal featuring the Special Olympics logo. Felling Trailers wanted to bring awareness of Special Olympics and help provide funding for the individuals who take part in and benefit from the events and services provided by Special Olympics Minnesota (SOMN). The online auction ran for 12 days, from Sept. 24 through Oct. 5, ending with Middendorf's winning bid of $2,900. One hundred percent of the $2,900 winning bid benefits Special Olympics Minnesota. Special Olympics organization does not receive any government funding however they continue to grow due to the financial support from individuals, businesses, civic groups and events like Felling Trailers' Trailer for a Cause. The mission of Special Olympics Minnesota is to offer children and adults with intellectual disabilities year-round sports training and competition. Through Special Olympics' athletic, health and leadership programs, people with intellectual disabilities transform themselves, their communities and the world. Today, Special Olympics is the largest, fastest growing sports program in the world, representing more than 4.5 million athletes in more than 170 countries. Special Olympics also is the only organization in Minnesota, the United States and the world utilizing the unique benefits of sports to improve the lives of people with intellectual disabilities. For more information about Felling, call 800/245-2809 or visit www.felling.com. Auctions Business News Felling Trailers,Inc.